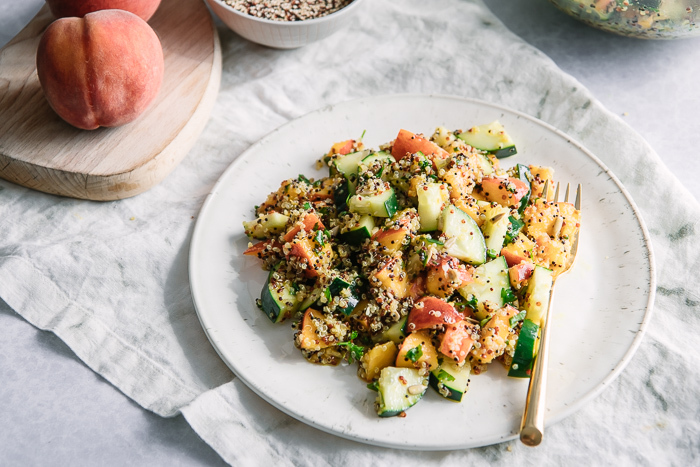 Savory Stone Fruit Quinoa Salad, a vegan fruit and grain bowl made with fresh peaches, cucumbers, and herbs with a cumin turmeric dressing. The perfect summer side dish! Ahhh, peach season. The time of year when the peaches, nectarines, plums, apricots, pluots (apriums?) trickle in for a few weeks and then suddenly the markets — and your baskets — are full and it’s all you can do to eat them before they go bad. Or is that just me? Tell me I’m not alone here. I’ve had stone fruit for breakfast with our Pluot Brown Sugar Pancake, stone fruit for lunch in this Summer Peach Panzanella Salad, and even stone fruit as an appetizer with this Summer Stone Fruit Cheese Platter. And now it’s time to get savory with stone fruit for dinner with this delicious Savory Stone Fruit Quinoa Salad. 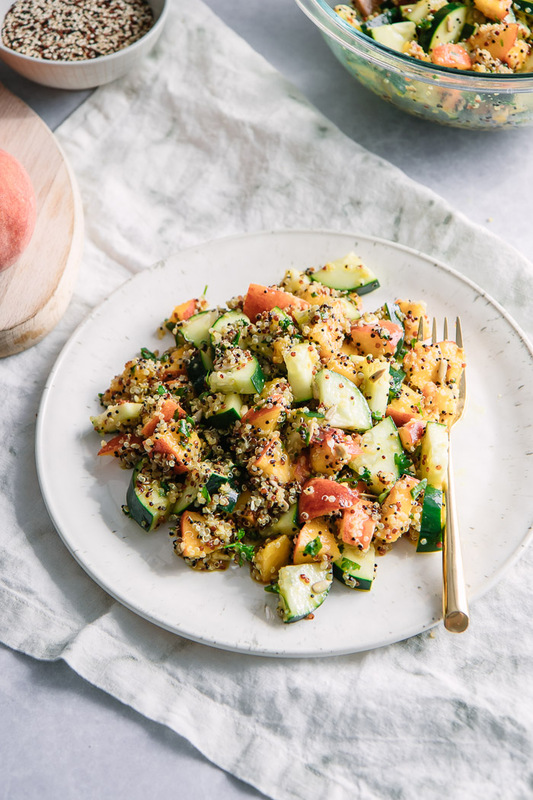 A plant-based peach, cucumber, and quinoa grain bowl tossed in a light spiced herb dressing. Ready in under fifteen minutes, this super simple plant-based salad is perfect as a side dish or an entree and is great the next day as leftovers. Savory fruit salad, you say? Trust me, it’s delicious. And super easy. You’ll only need about fifteen minutes to make this super simple salad and you likely have many of the ingredients on hand. First you’ll cook the quinoa, and in the meantime cut the peaches and cucumbers. The fruit, veggies, and grains are then tossed in a light homemade dressing of olive oil, turmeric, cumin, and fresh herbs and topped with your favorite seeds (we used sunflower, but sesame would be a good choice as well). Easy, hearty, and delicious! Recommended tools: This simple salad does not require much equipment, but I do recommend kitchen staples such as a good quality set of kitchen knives and glass mixing bowls, for serving and storing. This savory fruit salad is light enough to be a side dish, but hearty enough with the quinoa to be eaten as a main or entree. We had it as a side dish with grilled fish with a spicy herb sauce and it was a perfect savory, yet slightly sweet, addition on a hot summer night. High in plant-based protein from quinoa, a grain that originates in the Andes regions of Peru and Bolivia and was named the UN’s “super crop” in 2013. Quinoa is also a “complete protein” because it is a grain that provides all of the essential amino acids our bodies need (not many plant-based foods provide all of the proteins we need). It is high in fiber, which is essential for good digestion and plays a role in heart health. It also is a crucial factor in a the health of our gut microbiome, which research suggests may affect mood and happiness. It is high in potassium, vitamin C, vitamin A, and plant-based iron. The combination of orange peaches, green cucumbers, and fresh green herbs also provides antioxidants, which are important to help the body repair cells. We hope you love this simple fruit grain salad recipe as much as we do, it’s a great way to incorporate those summer stone fruits onto your lunch and dinner plate! Looking for more summer recipes? Try our Pineapple Pico de Gallo Avocado Cups or our Roasted Beet Fries with Vegan Green Goddess Avocado Dip. 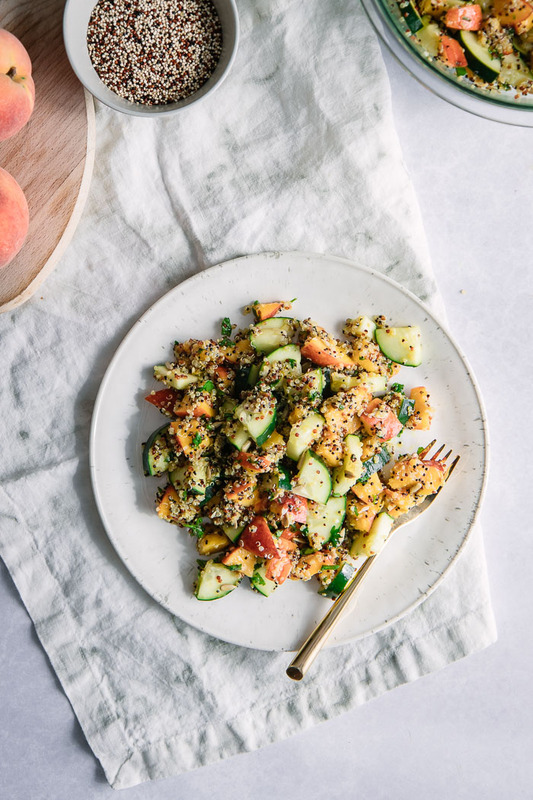 Did you make this Savory Stone Fruit Quinoa Salad? Save this recipe for later by pinning to your favorite summer salad Pinterest board and if you make this recipe leave us a comment and recipe rating below and tag us on Instagram so we can see your salad creations! Combine olive oil, lemon juice, garlic cloves, cumin, turmeric, salt, and pepper into a large mixing bowl and whisk to combine. Add cucumber, peaches, cooked quinoa, cilantro, and parsley to bowl and mix to coat, then let sit about five minutes. Then add quinoa and mix well to combine. Top with sunflower seeds and serve! 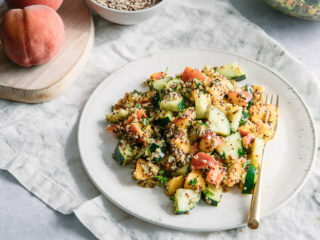 The reason for leaving the peaches and cucumber in the dressing before adding the quinoa is to coat the fruit and veggies before adding the grain, which will soak up the dressing and the flavor will not coat the produce. Leftovers & Storage: This stone fruit grain salad is great as leftovers and can be stored in the refrigerator for up to four days. The cucumbers and peaches will soften after a day or two, and we actually liked the taste of it more after it sat and marinated for a day. 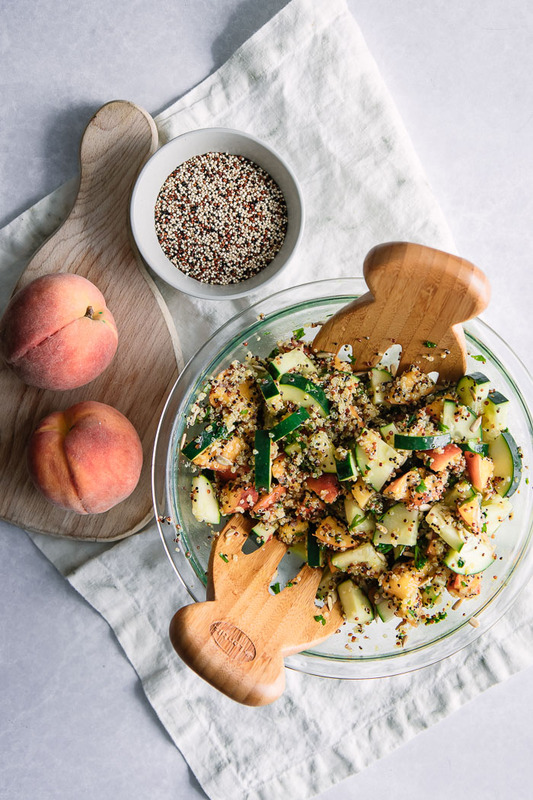 Nutrition: This Savory Stone Fruit Quinoa Salad is a super healthy vegan grain salad! It is low in sodium and saturated fat and high in fiber and plant-based protein. It is also a good source of vitamin C, vitamin A, iron, and potassium. I’ve never tried fruit with quinoa but this looks SO summery and fresh! And no, you’re not alone, I at 3 peaches for breakfast just this morning before they went past their best! I can’t get enough of stone fruit season! I recently had a savory grain salad with fresh peaches and it was the inspiration for this delicious quinoa salad. Thanks so much for stopping by! I’m so happy to hear that! It’s one of my favorite simple fruit salads, I’m glad your team enjoyed it. Thanks for leaving your review! Sustainable Nutrition + HealthWhat are Superfoods and Should You be Eating Them?